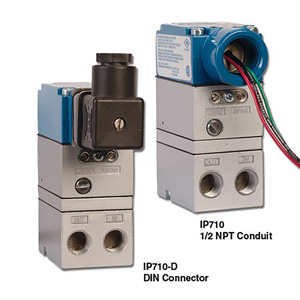 The IP710 series l/P transducers are a series of compact high accuracy electronic pressure regulators that convert a 4 to 20 mA signal to a proportional pneumatic output. Utilizing internal solid-state feedback circuitry, the IP710 provides precise, stable pressure outputs to final control elements. Immunity to the effects of vibration or mounting position, high tolerance to impure air, and low air consumption make this unit ideal for use in demanding applications. Typically these units are used for pneumatic applications that require electronic pressure control of valve actuators, pneumatic valve positioners, air cylinders, clutches, brakes, dampers, louvres, and pumps. Original equipment applications include manufacturers of machinery for grinding or polishing, welding, dispensing, web tensioning, semiconductor manufacturers, automated assembly, conveying, leak testing, food processing and painting to name a few. Multiple choices for wiring and porting simplify installation and decrease the time required to do so. In addition to standard wall, panel or pipe mounting, an optional DIN rail mounting kit is available. Note: All IP710s come with mounting bracket and operator’s manual.